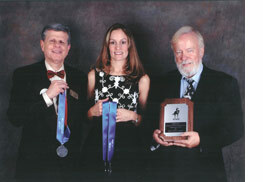 Uwe and Debbie Hill attended the 2006 USDF Convention in MO and collected a few Ribbons and Plaques. Brocken ended up 17th in First Level open in Horse of the Year. Gibraltar was "Reserve Champion" in 3rd Level Freestyle and "Freestyle Performance" in Horse of the Year and ended up Champion for Andalusians in 3rd Level Open and 3rd Level Freestyle. 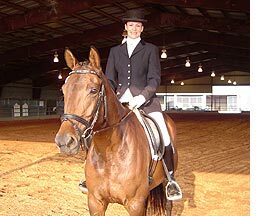 The American Hanoverian Association has contacted us to inform us that Brocken has been selected for the American Hanoverian Society Young Horse Training Symposium with Scott Hassler January 27 in Florida. Brocken had 19 & 20 entrants in her classes. She pinned 8th in First level and 7th in Second Level. A wonderful result even though Ellinwood hoped for some higher ranking. We are very proud of Brocken & Debbie. It was Gibraltar's year to shine and he did not disappoint us. Gibby became Champion in his 3rd Level Freestyle. What a thrill!! SAXONY in 2002, BROCKEN in 2005 & GIBRALTAR in 2006. At the MSEDA Dressage at Kentucky Horse Park (9/8/06) Gibraltar and Brocken did well again! Brocken placed 1st in Second Level Test 4 and 2nd in Second Level Test 2 and scored 72.941 % in a First Level Test 2. Gibraltar won both his classes with a 66.222% in Third Level Test 3 and 66.512% in Forth Level Test 1. The Regionals in Atlanta are next on 10/15 where Gibraltar is qualified for 3rd Level and 3rd Level Freestyle and Brocken is qualified for First and Second Level. 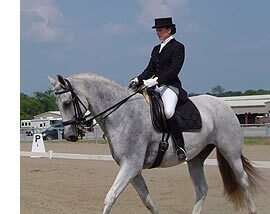 He is ranked 43rd with a median score of 65.667 in Third Level from over 200 ranked horses. He is ranked 2nd with a median score of 72.083 in Musical Freestyle Award 3rd Level. 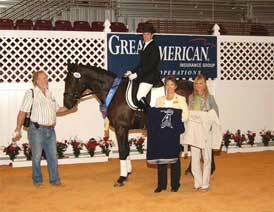 Gibraltar and Brocken had great success with Debbie Hill and won six out of six Classes. Gibraltar won 3rd Level Freestyle with a score of 69.792 and 3rd Level Test 3 with a 69.333. Brocken won 3 Tests in 2nd Level with a 66.078 twice and 67.234 and a 1st Level Test 2 with a 66.176. 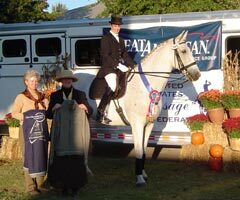 Both are ranked in the Top 30 in the "USDF Horse of the Year Award", Gibby may even be in the Top 5 in the Freestyle events. 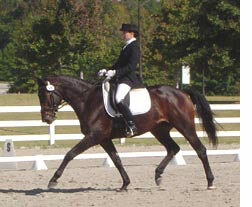 win High Score of Show in the EXPRESS Dressage 2006 First Level Open with 75.662 %. They also win and qualify 2nd Level Open with 67.647 %. Brocken also wins her F5 Test for Five Year Olds with a score of 7.24 and is heading to Lexington,KY for the USEF Championships. 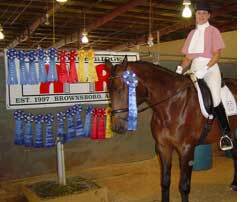 Brocken, a 4 year old 16.1H Hanoverian mare by Batido, owned by Ellinwood Brown-Miegel of FL, and ridden by Debbie Hill, wins the Region 3 Championships at Training Level with a score of 71.731%.